Nearly six and a half years in the making. 22 feet from bow to stern. Measuring a meter across at its widest point. 1/40th the scale of the real thing. Nearly a quarter-million individual LEGO pieces. And the whole thing weighs 330 pounds. 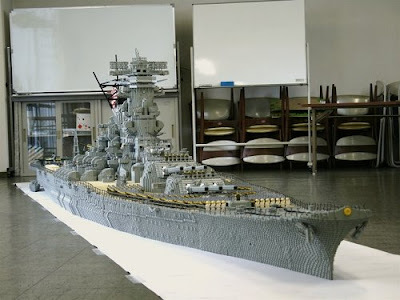 If this is not the biggest LEGO model of all time, it is certainly the largest one that I know of. Mash here for more about this incredible model. And thanks to Shane Thacker for the great find! Now you've got me singing the theme song to Starblazers! Anyhow, when I think of Lego blocks, I think of the usual things: blocks. I cant see how these Lego artists build these things that arent so, well, blocky. I mean, I look at this battleship and I see rounded curves, and round, gun barrels, round pipes, and thin layers upon thin layers. And I'm trying to figure out how one makes those things out of squarish or rectangular blocks. I also wonder how much money it cost him to build this in Lego blocks alone.